Love Total Recall? Who doesn’t. Want to help the refugees in Calais? Again, who doesn’t. Lucky for you, Pump Action Doll House Pop Up Cinema is in the mix to COMBINE these two diverse things into ONE NIGHT OF ACTION! Roath’s own Pump Action Doll House Pop Up Cinema is immensely proud to be fundraising for Newport2Calais this March to help get well needed aid to the swelling humanitarian crisis on our doorstep. 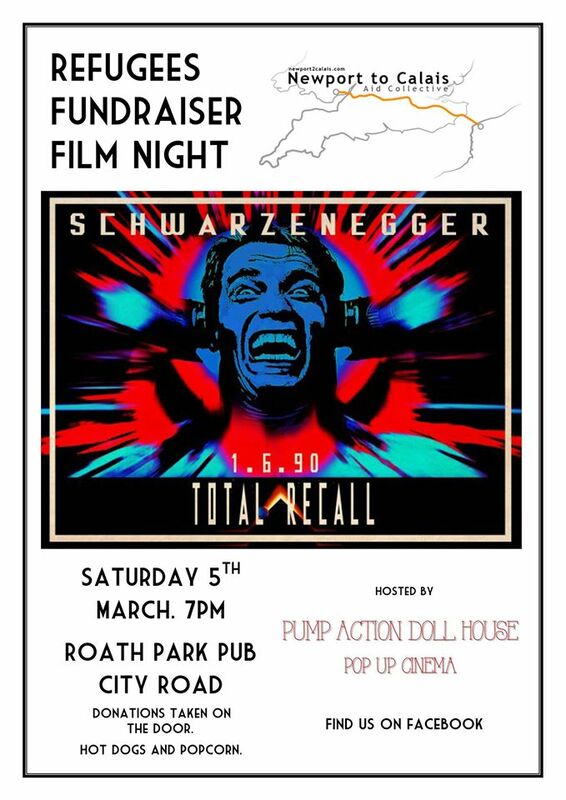 The Roath Park Pub will once again be transformed into a cinema to screen the universally adored cult classic Total Recall starring Arnold Schwarzenegger. Donations will be taken on the door and a variety of cinema snacks including hot dogs and popcorn will be available. All proceeds will go to Newport2Calais who organise regular aid runs to the refugee camps and are in desperate need of funding. Total Recall – being shown at The Roath Park Pub (170 City Road, Cardiff), 5 March, 19.00.